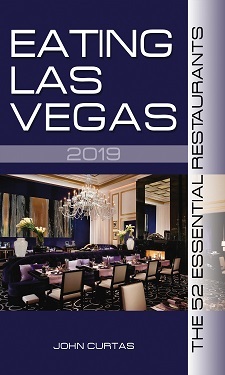 The reason Eating Las Vegas® keeps harping on how good the food is at P. J. Clarke’s is because we’re astounded at how much better its provisions are than Palm’s or Joe’s Stone Crab, but we can’t help but noticing the latter always seem to have twice the customers. Can’t you recognize quality (and sinfully good food) when it’s right under your nose? P. J.’s, for example, has the best use of iceberg lettuce ever invented: cutting young heads of it into wedges and drizzling it with a devilishly pungent blue cheese dressing (and chunks o’ blue cheese), then adorning everything with big chunks o’ bacon, cherry tomatoes and green onions. Blue cheese and bacon is a match made in heaven, and using lettuce as a carrier for these sinful delights is almost enough to send us to confession. The others are too numerous to count. We tried to eat at PJ Clarke’s, our specific destination on a holiday weekend, but the staff was treating it like a private club. We waited at the entrance & the staff appeared to look at us and then turn around and go in the other direction — and it wasn’t busy at all. The front is set up entirely wrong — like a barrier and not an entrance, plus there is no one looking out for the arrival of customers. So we went to the Palm where we were warmly greated and invited in to dine at a lovely table. Although the food at Palm’s isn’t quite as super as 20 years ago, they have kept the prices about the same and the staff was just terrific. It doesn’t surprise me that Clarke’s isn’t getting much business, even if it has good food. Ditto with Morrells at the Palazzo. ELV, why are you trying so desperately to save this restaurant from going under? Agree with the previous 2 writers, whats with the pj clarkes love? Its a chain bar, not for the food lovers. I’ve been the ones in chicago, and it was nothing more than a bar with bar food. And not great bar food. ELV responds: You find us a better iceberg wedge salad, with better bacon, tangier blue cheese dressing, and fresher ingredients and we’ll rave about it too. Yes, Clarke’s is now a chain…but it’s a good one, using much better groceries than any other franchised beef emporium around. As for @LSM’s complaint, we’ve eaten here 5 or 6 times (sometimes known to the staff, sometimes not) and have walked by it a dozen others, and always seen a nice young host(ess) person standing outside welcoming people. Calling Palm’s food not as good as it was 20 years ago is like saying Cher isn’t the singer she was in the 1980s. I gave PJ Clarke’s a try on two occasions. We had lousy service with an uncaring attitude. The hamburger was OK at best and the wedge salad was a wedge salad that I have had at ten different high end steakhouses. A better one? Jeff Ruby’s in Cincinnati and Wolfgang’s Park Ave. in New York. Wolfgang’s is not on the menu, but they will make it for you and it’s delightful. PJ’s will be out of business by the fall. There’s a reason Joe’s always has hundreds more customers than PJ’s does…quality of food and service! My meals have always been top notch and service was warm and caring. PJ’s has mediocre food and horrible service. Hundreds of people can’t be wrong. His own self-interest is the main motivation for his reviews, not the public interest, obviously. Why do you think he dresses in such an easily identifiable manor? He wants the good stuff and to be a celebrity. Take his “reviews” with a salt lick.